Oak Tree Lakes is a friendly, family run business. We are a complex comprising of Ash pond which has been established over 100 years and will accommodate 15 fishermen and our 2007 addition, Oak Lake, which houses 27 custom built platform pegs. We cater for both match and pleasure fishing offering a scenic and relaxed setting. 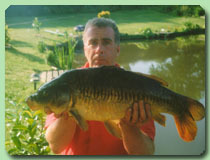 Our well-stocked waters include a variety of carp, tench, bream, skimmers and perch among others. Match bookings now being taken. Call Steve to discuss and arrange your requirements.